Dr. Matrishva B. Vyas is an Orthodontist by profession based in Nagpur. He did his BDS and MDS from Govt. Dental College, Nagpur in 1992 and 1996 respectively. Sensing a need for photographic documentation of his patients, he took to learning photography. With the Tiger Capital of India being his home, his interest in wildlife photography was naturally piqued. Surprisingly, his first award in photography was for Glamour and Portraiture which he received at a competition held in Bangalore. 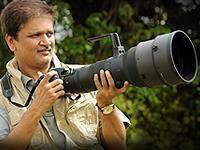 His work is regularly published in Sanctuary Asia Magazine, online international wildlife photography magazines, and has even made it to several Coffee Table Books on Tadoba, Bor and other parts of Maharashtra. He has also won several accolades notably a Special Mention at the Wild Maharashtra competition in 2012; 3rd prize at Kirloskar Vasundhara International Film Festival in 2014; 3rd price for I AM Into The Wild Competition held by Nikon India in 2016 and a PSI Gold in 2016. He is a guest lecture at various national and international orthodontic conferences and regularly conducts courses on clinical photography, wildlife photography and street photography. He has also authored the book, “Clinical Photography in Dentistry”.